What options are there when exporting data? Options available for use when exporting data out of the exporter. This page refers to the options to exporting data using the exporter. When exporting data from the download button in the web app's record editor, you can use the map's extent, filtering options, and column setup options to limit what is contained in the record editors exported data files. There are several additional settings you can control to select exactly what to export from your Fulcrum account when running an export. 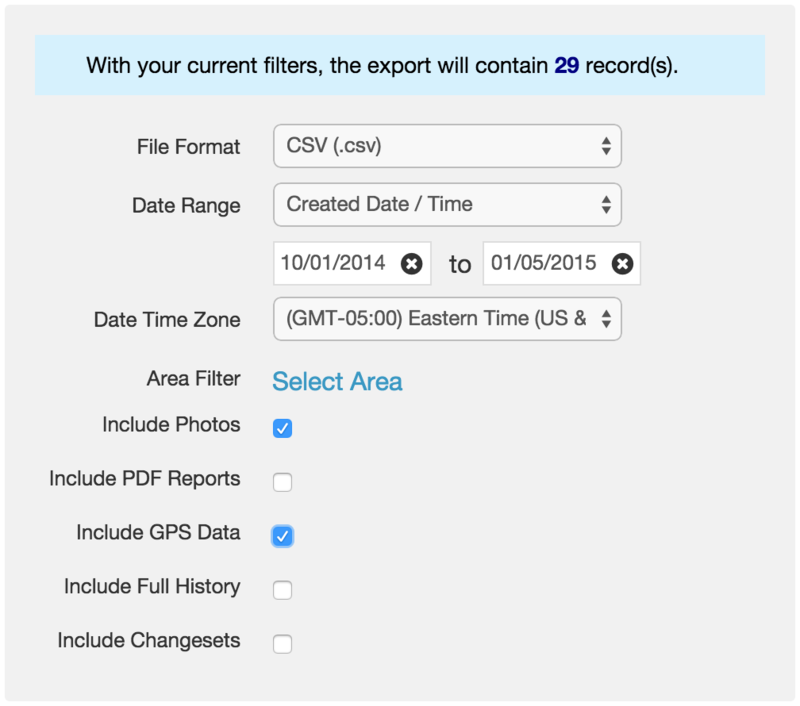 You can configure the filter options to limit the data that gets included when exporting, including filtering by geographic area or the date the record was created or updated. You may also choose to export multiple apps and/or projects’ data at once. This can be done by checking the boxes by the app or project names underneath the first export options box. In addition to the above options, there’s additional data you can also choose to export by checking the box next to the option. Date Time Zone: This will convert the timestamp information in your export to the specified timezone. Include GPS Data: This option will include GPS data captured from the mobile device when the record was created. This data will be added to the end of the export file. Include Photos: This will export all photos that are contained in any of the records that are being exported. You will also notice an additional file that will contain the photo’s EXIF data. Include PDF Reports: This will create individual PDF Reports for every record that is going to be included in the export.This is only available on select plans, please check out our plans page. Include Full History: This will include the full record history for every record included in the export file, the version column is used to distinguish between the different records versions. This is only available on select plans, please check out our plans page to see which plans offer this ability. Include Changesets Data: This will include a file that contains information on the changesets that took place during the date range, if set. This is only available on select plans, please check out our plans page.